Plan of the City of Aire and Fort of St. Francis with a view of St. Tindal, Nicolas 1687 1774. 19 1/2in x 15 1/2in (495mm x 395mm). (A+) Fine Condition. This beautifully hand coloured original copper-plate engraved antique map, plan & birds eye view of the French city of Aire-sur-la-Lys, a commune in the Pas-de-Calais department in northern France along with Fort St Francis and Fort St Venant – used by Lord Marlborough during the Spanish War of Succession (1701-13) – was engraved by John Basire and was published in the 1745 edition of Nicholas Tindals Continuation of Mr. Rapin\’s History of England. Paper thickness and quality: – Heavy and stable Paper color : – off white Age of map color: – Early Colors used: – Pink, blue, green, yellow General color appearance: – Authentic Paper size: – 19 1/2in x 15 1/2in (495mm x 395mm) Plate size: – 19 1/2in x 15 1/2in (495mm x 395mm) Margins: – Min 1/2in (12mm). Margins: – None Plate area: – Folds as issued Verso: – None. Background: Aire-sur-la-Lys is located 10 miles (16 km) southeast of Saint-Omer, by the banks of the Leie and the Laquette rivers. It is mentioned for the first time in 857 and developed around a fort or castrum built by Baldwin II, Count of Flanders in response to the Norman invasions. More growth followed with the establishment of the Collegiate church of Saint-Pierre by Baldwin V, Count of Flanders. The town was laid siege ten times between 1127 and 1710. It was separated from the County of Flanders and attached to the County of Artois in 1196. Subsequently ruled by the Burgundians then by the Spanish. 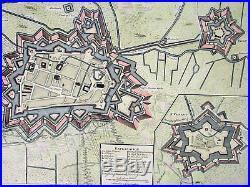 The town was besieged in 1676 by Vauban and retaken for France, although it remained a Spanish possession until 14 April 1713, when, by the Treaty of Utrecht, it finally became a part of France. De Rapins publication chronicles the History of Britain from the invasion of the Romans to the death of Charles I. Very few comprehensive histories of England existed at the time and Tindal added his three-volume Continuation , of the Kingdom, from the reigns of James II to George II. Tindal\\\’s translation of de Rapins History, was first published in 1727. Tindal enlarged the volumes in their second edition (1732) to contain notes, genealogical tables and maps of his own composition. In 1745 Tindal published Tindals Continuation of Mr. Rapins History of England. Included with this edition was an atlas containing 45 maps, battle and town plans from the Spanish War of Succession (1701-13) that were engraved by Richard William Seale and John Basire. These maps represent battles that took place during the War of Spanish Succession, concluded by the Treaties of Utrecht. The war resulted from a dispute over who should inherit Spain and its possessions after its Habsburg rulers in 1700. The last Habsburg king of Spain, Charles II d. 1700 had left the throne to his closest relative in female line: Philippe de France, duke of Anjou, grandson of Louis XIV (Felipe V of Spain). The closest relatives in male line, the Habsburgs of Austria, disputed this claim, and many European nations did not want to see French princes reigning over both kingdoms. The Utrecht treaties recognized Felipe V of Spain, but transferred the Spanish possessions in the Netherlands and Italy to Austria and to Savoy. To reach the goal of separating the crowns of France and Spain, the treaties required Felipe V to relinquish all claims to the French throne, and the remaining French princes to relinquish all claims to the Spanish throne. The War of the Spanish Succession, was also known as Marlboroughs Wars, that was fought in Europe and the Mediterranean, and were the last and the bloodiest of the Wars between England and France under Louis XIV, and the first in which Britain played a major military role in European military affairs. In 1685 after the death of his father he moved to England but after being unable to find employment moved to Holland and enlisted in French volunteers at Utrecht commanded by his cousin Daniel de Rapin. He accompanied the prince of Orange to England in 1688 and participated in the Irish campaigns of the siege of Carrickfergus, Battle of the Boyne and Limerick. Rapin resigned to become tutor to the Earl of Portlands son. He settled in Holland where he began work on The History of England. It was published in Holland in 1724 in 8 volumes. The work was an attempt to be exhaustive in the spirit of the eighteenth century philosophies by treating the subject from prehistoric times up to the date of publication. Please note all items auctioned are genuine, we do not sell reproductions. A Certificate of Authenticity (COA) can be issued on request. What is an Antique Map. The word Antique in the traditional sense refers to an item that is more than a hundred years old. The majority of antique maps for sale today come from books or atlases and have survived due to the protection offered by the hardback covers. The first thing to determine when staring a collection or purchasing an item, is what is important to you. Most collectors prefer to build their collections around a theme. You may decide to collect maps from one region or country, charting its development through time. Similarly you could collect maps of one particular period in time, by type i. Sea or celestial charts or by cartographer. The collector might also want to consider the theme of cartographical misconceptions such as California as an island or Australia as Terra Australis or the Great Southern Land. The subject is so wide that any would-be-collector has almost endless possibilities to find his own little niche within the field, and thereby build a rewarding collection. Starting a collection & pricing. Pricing is based on a number of different factors, the most important of which is regional. In any series of maps the most valuable are usually the World Map and the America/North America. The World because it is usually the most decorative and America because it has the strongest regional market. Other factors that come into play re: price is rarity, age, size, historical importance, decorative value (colour) and overall condition and quality of paper it is printed on. As specialised dealers, we frequently work with first time map buyers who are just starting their collection. Classical Images was founded 1998 and has built an excellent reputation for supplying high quality original antiquarian maps, historical atlases, antique books and prints. We carry an extensive inventory of antiquarian collectibles from the 15th to 19th century. Our collection typically includes rare books and decorative antique maps and prints by renowned cartographers, authors and engravers. Specific items not listed may be sourced on request. Classical Images adheres to the Codes of Ethics outlined by the Antiquarian Booksellers Association of America (ABAA). We are a primarily an online based enterprise, however our inventory may be viewed by appointment. Track Page Views With. Auctiva’s FREE Counter. 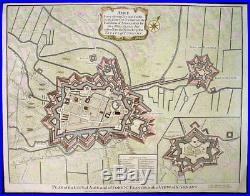 The item “1745 Tindal Antique Map of Aire-sur-la-Lys, Fort St Francis & St Venant, France” is in sale since Monday, October 29, 2018. This item is in the category “Antiques\Maps, Atlases & Globes\Europe Maps”. The seller is “searching01″ and is located in Ivanhoe, VIC. This item can be shipped worldwide.